The Red Raiders came in as the underdogs, unranked and having lost their last five games in a row. SAN DIEGO — The last two Holiday Bowls have featured upstart Pac-12 teams that came into the game with high expectations only to be punched in the mouth by middling Big 12 teams. An anticlimactic finish to what was otherwise a banner year. No. 14 Arizona State came into the 2013 edition of the game fresh off of a Pac-12 Championship game loss to Stanford. 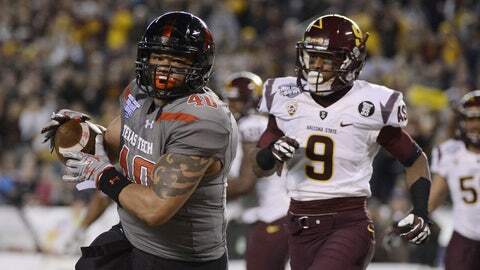 The heavily-favored Sun Devils got off to a sluggish start and let Texas Tech run all over them, resulting in what head coach Todd Graham called an "embarrassing" 37-23 loss to Texas Tech, Monday night at Qualcomm Stadium. "I’m very embarrassed for our program," Graham said. "We just didn’t come prepared to play." Kliff Kingsbury, the record-breaking former Texas Tech quarterback and one-time Heisman hopeful, won his first bowl game as a head coach. He handed over the keys to the offense to true freshman Davis Webb who then inked his own name in the record books when he threw four touchdown passes to tie a trio of former quarterbacks, most notably Jim McMahon, for the Holiday Bowl record. The Red Raiders came in as the underdogs, unranked and having lost their last five games in a row. But the youngest head coach in the BCS had an undeniable fire that spread to his players. "Everybody was picking them," Kingsbury said. They were one of the top 15 teams in the country, we knew that sentiment going in… They felt it all week. It was a celebration of Arizona State and it should have been. "But we wanted them to know that we were here too." In the grand scheme of the bowl game slate, the Holiday Bowl is one of the best on paper. All week players have enjoyed sunny San Diego weather, attractions like Sea World, the San Diego Zoo and a luncheon thrown in their honor on the harbor by service men and women. "It was the best bowl experience I’ve ever had," Graham said. "Until today." The Holiday Bowl used to be the award for the better Pac-12 teams that ultimately didn’t have much of a chance of getting into the Rose Bowl. Recent trends have the game being awarded to the Pac-12 team that came dangerously close to a BCS game and it has become a sort of consolation prize for those that just barely fell short. I’m very embarrassed for our program. We just didn’t come prepared to play. Last year, UCLA came within inches of making "The Grandaddy of Them All." Instead, Baylor trounced the Bruins in an ugly, listless performance. Arizona State allowed more than 400 passing yards for the first time 2004. Reginald Davis ran a kickoff back for a 90-yard touchdown, the third-longest in Holiday Bowl history, and ASU settled for field goals on four drives. One was a missed attempt from 24 yards to close out the second half. A sloppy, rushed kick by Zane Gonzalez that sent the Sun Devils into the locker room dejected and frustrated, almost a microcosm of how the entire game unfolded for Arizona State. Graham tried to take responsibility. His quarterback Taylor Kelly tried to take it also. But the postseason isn’t about assigning blame; it’s about proving who is the better team. Monday night in San Diego, it was Texas Tech. "This game is meant to be played with passion. You’ve got to bring it every single game," Graham said. "They brought it."